Back to where it all began, we hosted 200+ personalization-obsessed marketers from 36 brands around the globe. Here's what we learned this time around. A few weeks ago, we held our second Personalization Pioneers Summit in Berlin, Germany. Back to where it all began, we witnessed an exciting turnout, hosting 200+ personalization-obsessed marketers from 36 brands including the likes of Adidas, IKEA, Microsoft, HelloFresh, Idealo, Lamoda, Ozon, MediaMarkt, Swarovski, Hugo Boss, Lidl, and more. Attendees traveled from seven different countries for eight powerful presentations and the opportunity to network with those who are working every day to take their personalization efforts to the next level. And with 57 Personalization Certifications granted, it’s safe to say the next generation of Personalization Pioneers are upon us. It’s truly amazing to think back on this time last year when we were just kicking off our inaugural Summit event here in Berlin. With high hopes of connecting industry leaders and inspiring innovation across a burgeoning field, we never could have imagined the journey it would inevitably take us on and everything we’d learn. 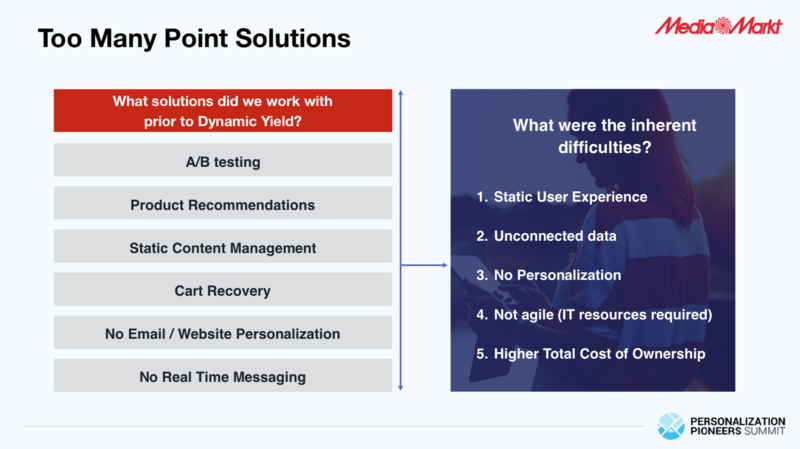 In Berlin alone, we witnessed a shift in how CRO professionals thought about the customer experience, moving from optimizing design elements to thinking about the entire shopper, gamer, fan or reader journey and how to optimize every element of it. We discussed the rise of a wildly competitive landscape as barriers to entry had begun to crumble, made possible by the influx of new marketing technologies built to deliver superior digital interactions. And also touched on how technology alone wasn’t enough to help marketers achieve their goals. We heard how you can scale content production by serving multiple variations to different audiences — resulting in delighted users and meaningful uplifts. And with every event, the impact, reach, and influence has grown significantly, compounding as we navigated across the globe to additional stops in Singapore and New York City. You could feel the excitement in the air as attendees entered the building, surveying the room in preparation for the day ahead. Many new faces lined the row of chairs, as well as familiar ones — those interested in benchmarking the current state of personalization from that of last year. With an action-packed agenda, the day had more than its fair share of memorable moments, leaving dreams of more personalized experiences buzzing in the minds of all who were present. For brands like Electronic-Star, a once niche store specializing in DJ equipment, combatting Amazon meant becoming a multi-category online mall. Now selling equipment from dozens of categories including kitchen equipment, sports & fitness, gardening, and more, the new business model left brand loyalists feeling confused about what had happened to their go-to-place for all things Audio / Visual. With a significant amount of trust lost, Chal-Tec, one of the biggest eCommerce players in Europe, contemplated the future of one of its first independent shops. Upon testing various strategies such as creating themed destinations for electronic music lovers and even drastically lowering their prices, to no avail, Chal-Tec turned to personalization. Only through tailoring the experience for visitors with highly specialized interests was the team able to turn its failing online mall into a viable source of revenue again. 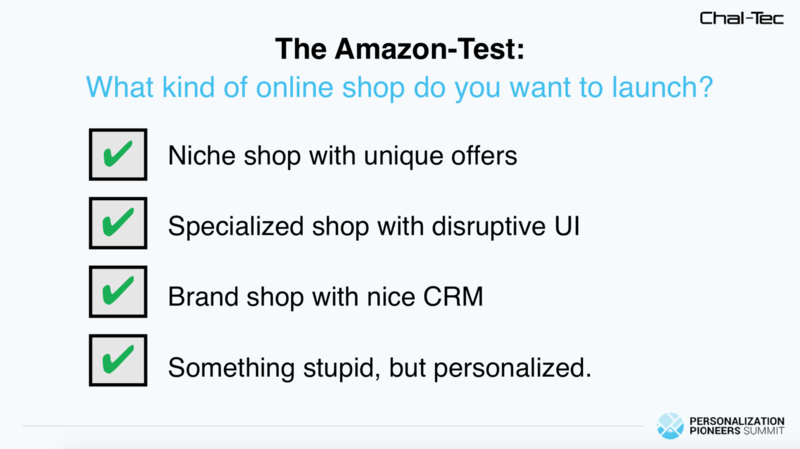 With a 27.5% increase in conversion rate as a result of deploying highly customized storefronts, it’s clear that personalization is critical in the age of Amazon and giant marketplaces. Companies are often limited by the rigidity of SaaS solutions that come with their own set of manuals and instructions. These can be incompatible with the technology stack presently in place and make implementing true personalization at scale a difficult task. No stranger to this paint point, global meal kit provider, HelloFresh, adopted a more flexible platform, one that allowed its team to customize deployments when and where they needed to most. 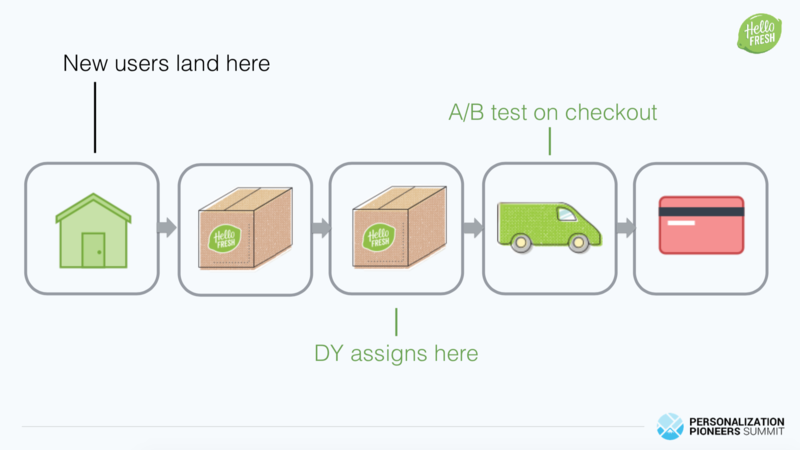 Using HelloFresh’s own proprietary unique identifier in order to unify and target their registered customers at the appropriate step of their journey, regardless of the device they use. Limiting promotions yet maintaining integrity by allowing just enough customers into an experiment required to achieve statistical validity, and then deactivating the promotion for all customers except those who made it into the test. 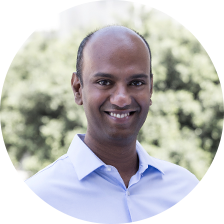 Maximizing mobile performance and speed by including visitors in tests and assigning a test variation one pageview ahead of the actual experience, reducing the need for additional computing. While a personalized experience awaits the customer during the checkout step, the individualized variation was determined prior to ever arriving at checkout. With so many business models and varying touchpoints, there is no one size fits all when it comes to tailoring the customer experience. Therefore, only an open, flexible platform offering adequate APIs and accommodates numerous implementation methods can meet today’s requirements for true personalization. Although MediaMarkt had mastered everything from A/B Testing to Product Recommendations, Content Management, Cart Recovery and Email, managing each of these activities was a different story. 1.5 years ago, David Geisen, the Chief Digital Officer at MediMarkt Spain, described how the multinational chain of stores selling consumer electronics employed over six point solutions to help them tackle various elements of the customer journey. Instead, a bloated tech stack ended up creating numerous silos and a less than optimal customer experience. A common woe for brands now all too familiar with the effects of data fragmentation, for those with additional global counterparts, the problem becomes exponential. In order to achieve a 360 degree view and merge all tactics towards optimizing every single touchpoint, MediaMarkt opted to select one, unified platform for powering the customer journey. In being able to rely on a global dataset that connects every region who touches the customer experience, the company has been able to evolve with the changing consumer habits across all geographies. Now, equipped with a better understanding of each market and the intricacies of managing a day-long event (sometimes two), our second trip comes with an entire year’s worth of experience and knowledge-sharing. Basically, this isn’t our first rodeo anymore and our upcoming events reflect a seasoned approach and fresh take on a constantly evolving industry — not to mention, stops in a few new locations.